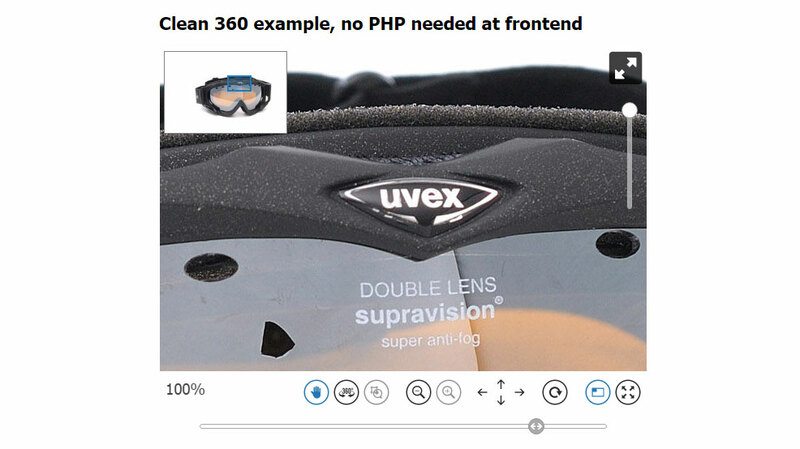 One of the outstanding features of the AJAX-ZOOM media viewer is the 360° rotary view of the products / objects. Each control element (there are plenty of them) can be switched off, expanded and adapted. In addition, the behavior and feel of the player is adjustable to the most refined detail. 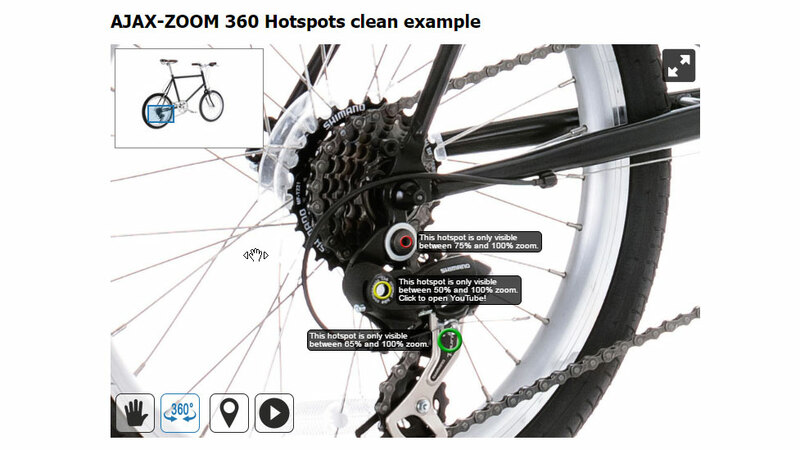 Above is an example of the standalone 360° product viewer with 36 images. The native resolution of each image is 7216 x 5412px. These are about 39 Megapixels! The images of the bike were shoot with "Hasselblad" but nowadays there are several affordable DSLR from "Canon" or "Nikon", which can achieve this resolution range. 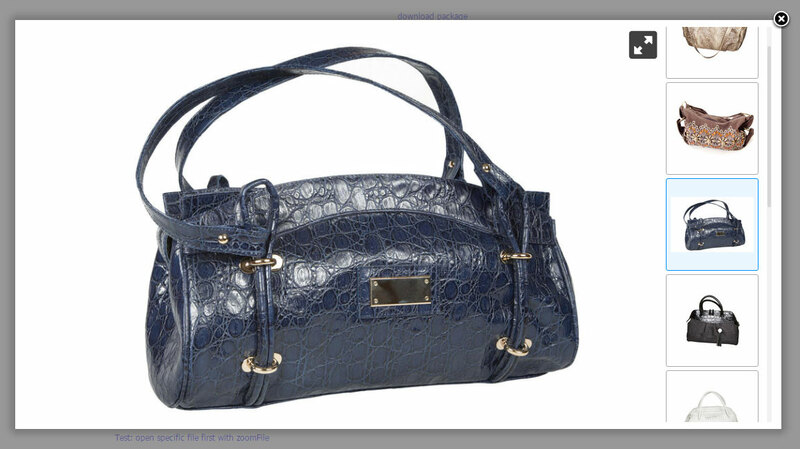 Despite the high resolution, the 360° product view is loaded very quickly. This is due to the multiscale resolution technology where only parts of the image are loaded, which are needed for the zoom level and viewport. However, you do not necessarily need to use ultra-high resolution to take advantage of multi-resolution technology in general. Even with 8, 10 or 20 megapixel images, the difference quickly becomes clear. If you do not want to use the multi-resolution technology, you can disable it by enabling the AJAX-ZOOM "simple mode" option. Please find more reading and visual testing on "simpleMode" option here. 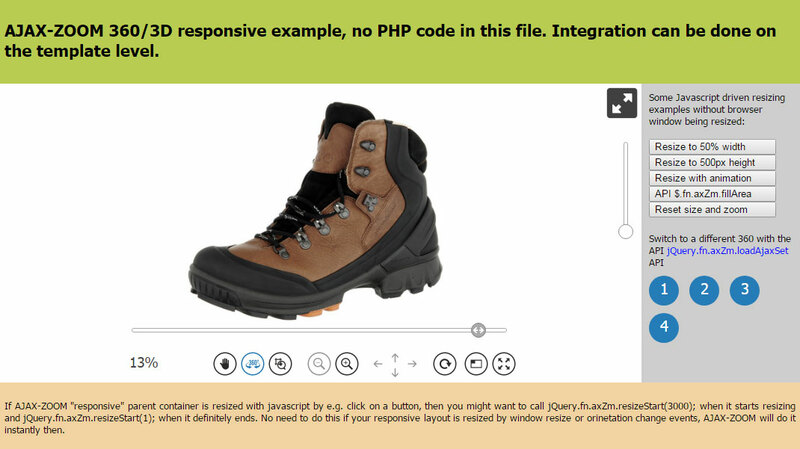 To tell the AJAX-ZOOM 360 viewer, which images it has to load for a 360 product view, you just need to define the path to the folder, where your 360 degree images are located. The software does everything else automatically. In case that the image tiles are not available yet, the multi-scaling process is initiated on-the-fly. Of course, you can generate these tiles and other scaled images with the batch tool before made a 360 available to the front end. 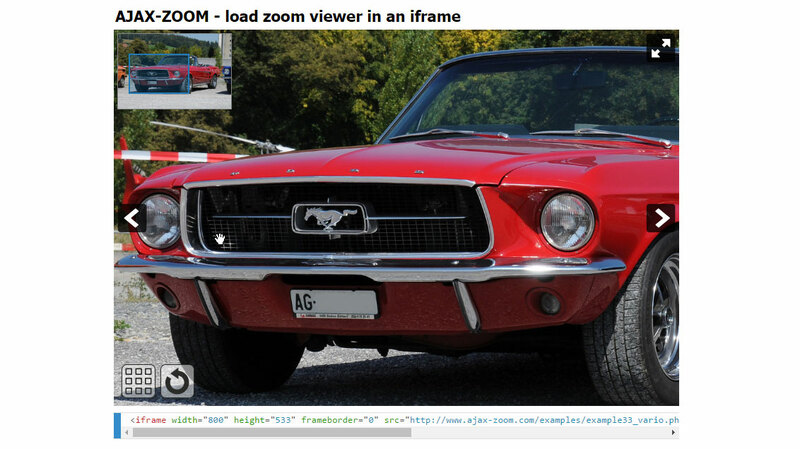 There are several methods to integrate the AJAX-ZOOM 360 Viewer into existing application. You can embed the 360 player directly into a responsive container or initiate it in a modal box from a link. It is also possible to start the player in full screen mode or full browser window. With responsive embedding, the player instantly adapts to the size of the outer HTML element, so you do not have to take care about this. 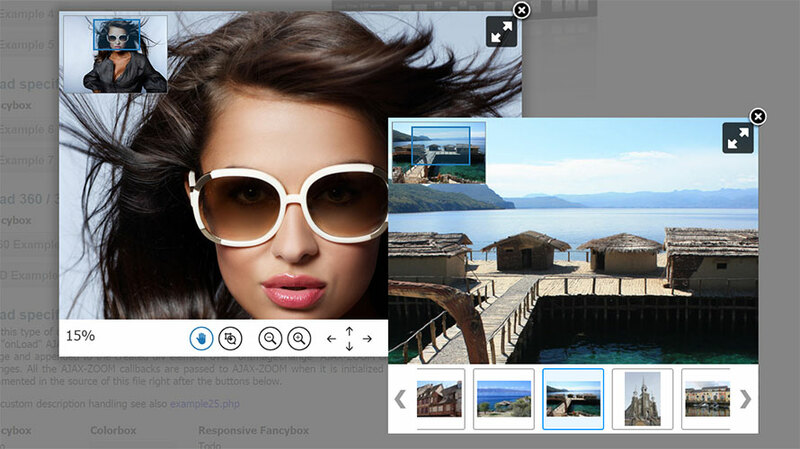 Possible UI controls are zoom slider, spin slider and the image map. By default, image map appears in the corner when the view is zoomed in. All these elements are optional. Additionally, there are various buttons, for example buttons to toggle between rotating and panning modes, to change into full-screen view, to zoom-in and out, toggle play / pause (rotation) or toggle hotspots visibility. All the UI controls and buttons are skinnable and there are several predefined skins already included. usually have a callback parameter, they can be concatenated as desired. This can be used e.g. to create a fancy self running presentation, which is especially interesting in conjunction with hotspots that can be switched on and off via other API functions. 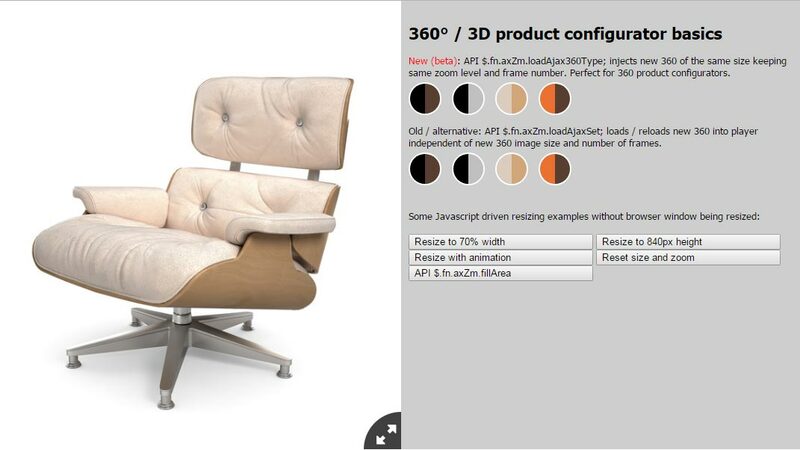 You can also exchange the 360 object within the player via AJAX-ZOOM API and this without losing the zoom level, see 360° / 3D product configurator basics example. The settings of the 360 behavior, such as direction of rotation or sensitivity, can be conveniently set via options located in the configuration file. Alternatively you can adjust them in the AJAX ZOOM onLoad callback by setting or changing jQuery.axZm['name_of_option'] object property. Enabling watermark allows effective protection of your original source images without any compromises. 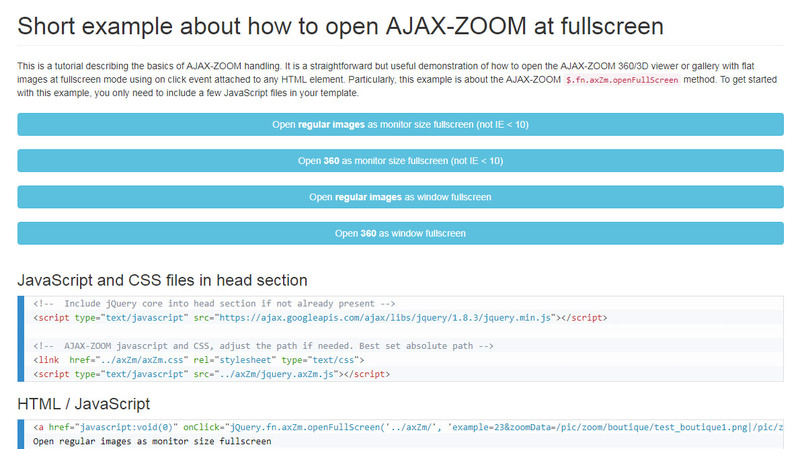 It is not required to use the AJAX-ZOOM "Modules / plugins / extensions", as AJAX-ZOOM can be used as stand-alone application or integrated manually nearly in any system. However, if a module is available for your system, it will facilitate and speed up the integration of AJAX-ZOOM into your CMS or e-commerce / shopping cart tremendously. If your server meets all technical requirements, then you will have AJAX-ZOOM running in your system within two minutes. 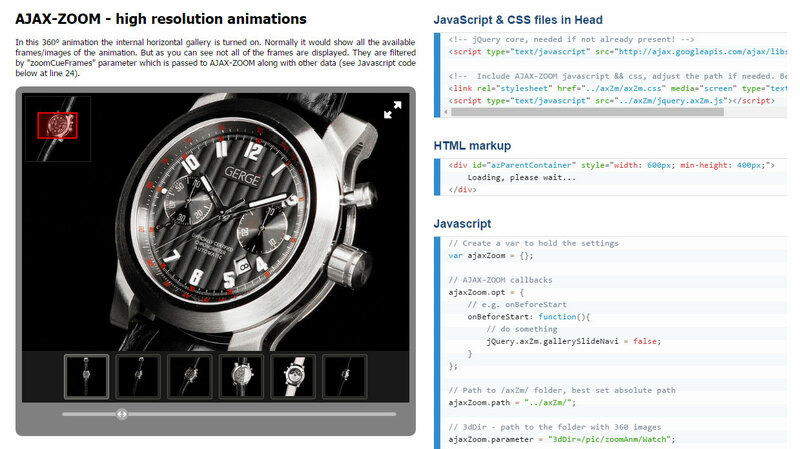 You can install and configure these AJAX-ZOOM modules with just a few clicks and without writing a single line of code. Available are modules for Magento, Prestashop, WooCommerce (WordPress), Opencart, Shopware und Oxid (the last two are commonly used in German speaking countries). 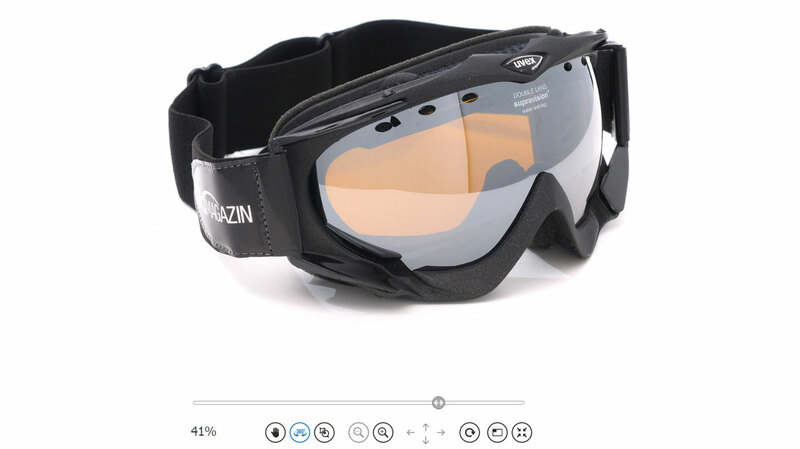 The license price primarily depends on the number of different images that display in AJAX-ZOOM image viewer on a domain. Unlimited options are available. The prices for the regular licenses are one-time payment! You can find the complete license agreement and price list on the download page. Before ordering, we advise you to download and test the demo (light) version within your development environment. If necessary, we can issue time-limited license keys free of charge. However, AJAX-ZOOM and AJAX-ZOOM modules / plugins for diverse CMS and shopping carts should work with few restrictions without entering any licensing data! If something does not work as expected, there must be a different reason than missing license. Do not hesitate to contact AJAX-ZOOM support if you encounter any technical difficulties.